MashButtons: Roccat Savu, can it be the Kone [+] replacement? 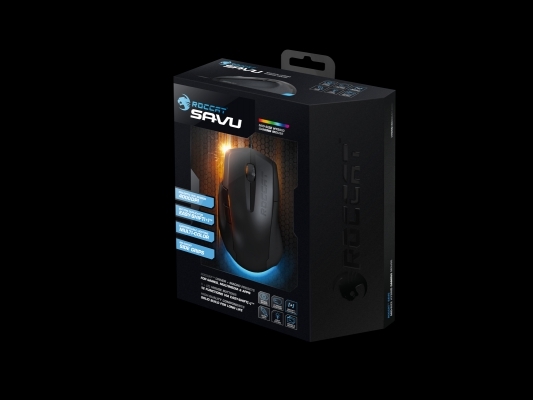 Our friends over at Roccat have provided us with their recent gaming mouse, the Savu. The last gaming mouse in which I reviewed from ze German scientists at Roccat was the Kone[+] and it was a solid piece of equipment. The Savu is quite similar but with more polish, a more compact size, a stat and trophy system, and a higher quality build. Much like Roccat’s previous gaming mice, this one comes equipped with the world’s only 4000 dpi optical sensor for precision when you need it most. Along with the new features, this gaming mouse also comes with a lower price point of $59.99, so now that the details are out of the way, let’s see how it fares. First and foremost I would have to say the new design and surface texture were the most noticeable changes. It now has a woven cord which not only looks nice but is durable as well, although it is a little stiff and adds slight resistance. The design is more compact and has a slightly lower profile, which felt much nicer on the wrists, which brings me to the texture. The top of the mouse has the same satin feel, but the sides that are molded to the right hand has a rough sort of grip tape surface that moves where you go. 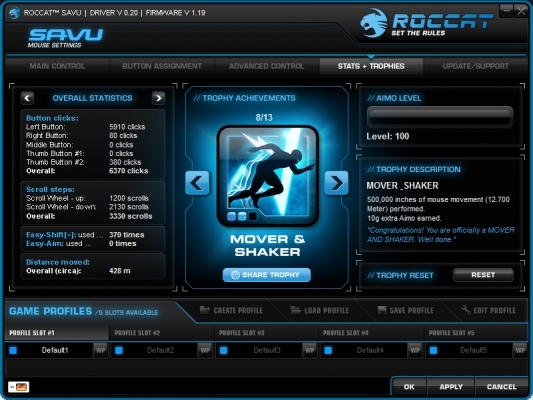 Lastly, the driver really shines, it is fast and easy to set up, the settings in which you can alter are beyond belief. You can map just about anything you would need to when gaming, the driver keeps track of all clicks, scrolls, and movements then provides achievements based on usage. As for what I didn’t like, that would still be the lack of driver support for Mac users. Sure, the Savu can still be used on a Mac, but you do not get access to the driver and all the settings. Like I had said earlier, having the woven cord provides addition resistance, more than that I have seen with other wired mice. There is a shift button which allows to map a second set of commands, but I would have preferred Roccat provide the option to map a command to it in case you did not need a second set or preferred to use the keyboard as a shift key. Lastly, and I am still not sure why this bugged me so much, but the placement of the light seems like a silly change in comparison to that seen on the Kone[+]. When all is said and done, between the two mice, I preferred the experience with the Savu. At first I was not a fan of the new grip surface on the sides, but after using for 8 hours a day at work and when gaming, it became a very welcome feeling. The driver is really where this device shines. 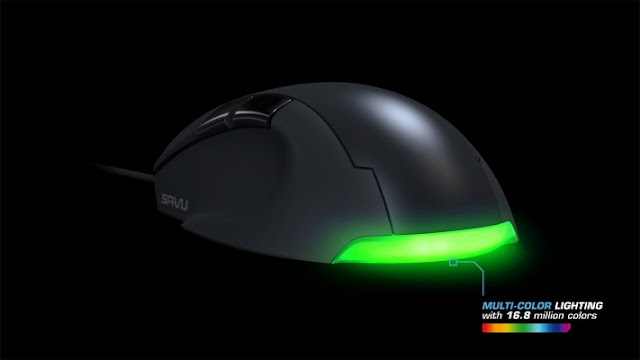 You can adjust any aspect of the mouse’s settings and fine tune to your liking with impressive results that will quickly be seen both gaming and working. 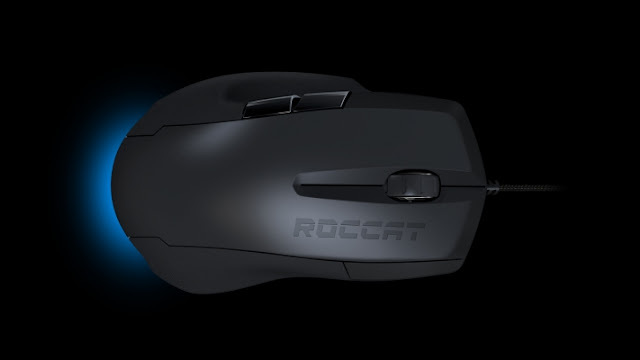 It really is disappointing that Roccat has not addressed the lack of support for the Mac gaming community, it is growing quickly and receiving more support as of lately, it would become a welcome edition to the Apple gamer.